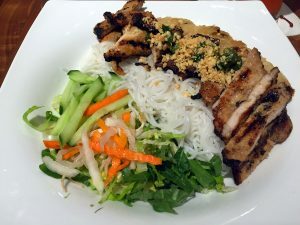 SOMI Vietnamese Bistro has taken the trendy Sugar House neighborhood by storm with its high-quality Asian-fusion menu. From steaming Vietnamese pho to Americanized Chinese, SOMI is serving up Asian specialties in a modern space. Try the bun dac biet, or SOMI vermicelli, for a flavor-packed vermicelli noodle bowl loaded with sliced pork, moist chicken and mouthwatering short ribs. Rounds of fresh cucumber, counter pickled daikon, and a fried spring roll bring together great tastes in one entree that’s part salad and part noodle bowl finished with a kicky chili vinaigrette dressing. HSL is the little sister of Handle of Park City — recently named the Best Farm-to-Table Restaurant in Utah by Travel + Leisure magazine — that has brought Chef Briar Handly’s spectacular style of presentation and taste to downtown Salt Lake. 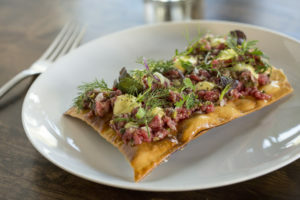 Taking over the old Vinto space on 200 South, the restaurant was revamped with a calming green color palette that welcomes diners to a breathtaking dining experience starting with the lavoush, featuring dry-aged beef tartare topped with capers, cornichon, an egg yolk and herbs. Stanza Italian Bistro & Wine Bar is the latest from the powerhouse Main Course Management responsible for Current. This new, gorgeous Italian-themed restaurant has risen from the rubble at the site of the former Faustina. At the helm in the kitchen is Executive Chef Phelix Gardner, who orchestrates an Italian feast of his favorites in the form of small plates, salads, pasta and entrées utilizing products seasonally available in Utah. 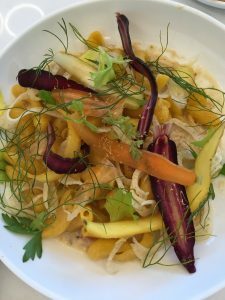 Try the carrot torchio pasta with milk-braised rabbit, pickled fennel and carrot ribbons on the dinner menu for a playful, yet traditional dish. Situated on Park City’s Main Street, 501 embodies every aspect of a rustic getaway with alluring charm. The lower level dining area holds to traditional ski lodge décor while providing the appeal of an upscale establishment. Floor-to-ceiling windows overlook Main Street and the breathtaking Park City mountain backdrop. 501’s menu is upscale American cuisine; the entrée selections are standard fare, but with undeniably distinctive twists. The Rocky Mountain Bison Burger is presented with sweet caramelized on a bun too big to fit in one hand. The burger was tender and flavorful, steaming hot and juicy. It was piled high with thick strips of bacon and topped off with salty, crunchy French fries. 501’s menu shows that the restaurant fits perfectly into Park City’s magical charm and appeal. 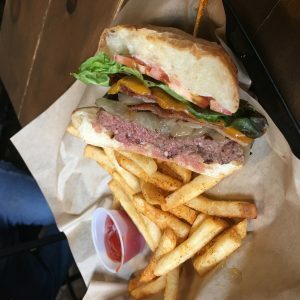 If you’re looking for a place to eat in downtown Salt Lake that somehow combines low-key relaxation with high energy atmosphere, appropriate for a boisterous group of college kids and for toddlers, has a full bar and still has a kids menu, and offers a variety of meals ranging from exotic adventures to familiar comfort foods, you might think you’re out of luck. But that’s probably because you haven’t been to Spitz. This little treasure trove of good vibes and great eats classifies its menu as “Mediterranean Street Food,” and their menu features a tempting choices of meals and drinks, craft beers and sangrias, sandwiches and wraps, salads, dips and desserts. 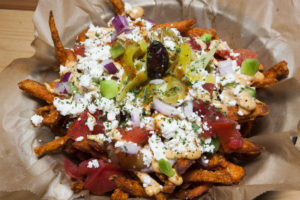 Opting for a classic best-seller, the Street Car Fries is a bowl of hot and crunchy French fries combined with the refreshing flavor of a Greek salad. The fries alone were amazing, but topped with garlic aioli, feta, tomatoes and green peppers, olives and pepperoncini. Let’s just say that this bowl is technically big enough to split, but it might be better to just get your own.